Made popular by the Nest thermostat, wireless, smart thermostats are one of the most common smart home devices today. With a smart thermostat, you can remotely monitor and adjust your home's climate settings and, with a smart home hub, integrate thermostats with the rest of your smart home. Changing thermostat settings when you leave the home, or adjusting thermostats based on temperatures in specific rooms all become possible when fully integrated. The most common smart home thermostats today are available from Nest, Ecobee, and Honeywell, and they can usually be self-installed in a few hours. Invisible: Controller will expose any thermostats connected to your smart home hub, giving you "at a glance" information about the thermostats in your home and direct control over heating and cooling set points and thermostat modes. Conveniently control your entire home's climate from the Invisible: Controller dashboard. For a complete list of supported thermostats, please see this Vera page. NOTE: While Vera does not directly support Ecobee thermostats out of the box today, a Vera plugin is available that adds Ecobee support to Vera hubs. 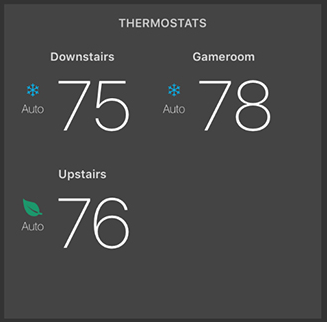 The Ecobee plugin has been tested to work with Invisible: Controller and Vera UI7.